To celebrate Winnie-the-Pooh's birthday this coming weekend, I've done two Pooh-inspired posts. 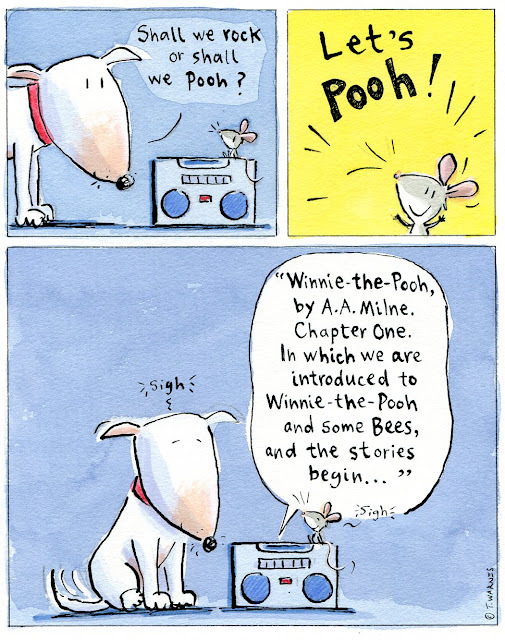 When my kids were younger, "Shall we rock or shall we Pooh?" was asked at the beginning of car journeys to decide what we should listen to (nowadays it's mostly rock). I can't tell you the hours we've spent listening to it on CD. We have it as a BBC recording read by the brilliant Bernard Cribbins, described by Bookaboo as 'the actor with a voice as warm as onion gravy.' Wonderful! LOL. Love it. Your strip always makes me chuckle! My Winnie The Pooh tapes were narrated by Alan Bennett. My Dad would always be in hysterics within the first few minutes, it was that line about it being a 'long long time ago...about last Friday' that got him. Winnie the pooh bear is cute.I love his quotes. There'll be more Pooh themes no doubt - in fact, check out my post '21:05' from June 15 2012!